I came across this story on The Third Man In and figured I would share it with you. It’s a pretty awesome story, reported by the Chicago Tribune, about Adam Burish surviving a pretty severe car accident and making it to the show. BTW, if anyone out there can introduce me to Adam, I’d appreciate it. Nothing better than an American born, blue collar workhorse playing in the show. The Chicago Tribune and Melissa Isaacson have the entire story. He has the remnants of a shiner under his right eye, which is to the hockey player what mashed toes are to football linemen. No big deal. 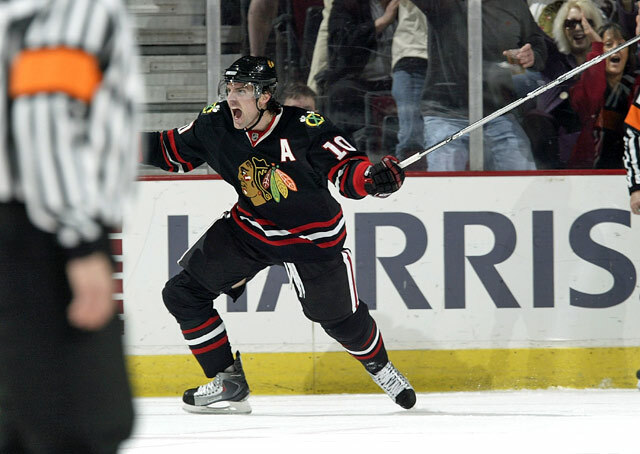 And even if it was painful, Adam Burish wouldn’t feel it. He keeps a picture of the car to remind him. And he talks to his family about how, if not for the worst thing that ever happened to him, he wouldn’t be in the NHL. Surely, he would not be the player he is. The car was totaled, the backseat –where he had been laying — gone. No backseat. “I think about it all the time,” said the Blackhawks’ right wing. “When I’m driving, and I have to swerve around something like those grates on the side of the road that go ding, ding, ding to make you slow down, my heart kind of stops and then I start to think about it again, and how lucky I am. All Burish remembers is waking up in a cornfield, spitting up blood, unable to breathe, his leg “going off to the side,” pain in his neck, blood everywhere. He was 17, sleeping, unbelted in the backseat with his sister Nikki, 16, driving and his mother Helen dozing in the passenger’s seat. The three were traveling from Madison, Wis., to a hockey tournament in Minneapolis when, somewhere near Eau Claire, Nikki lost control and the car careened into a 10-foot ditch, rolling four times and throwing Burrish some 40 feet from the car. I can’t really complain about the playoff so far. Bruins are up 3-0 on the Habs. The Rangers-Caps series has been fun to watch with Avery and his antics while Ovechkin and Semin are making it a real series. Detroit has taken it to the Blue Jackets. I expected a little more out of the BJs but it is their first playoff apperance ever, so I guess they will use this as a learning experience. Two good videos from the game last night: Comodore flipping himself into the Red Wing bench and RJ Umburger getting knocked silly by Brad Stuart. Speaking of learning experiences, The Blues got absolutely schooled by Vancouver. Even though I liked the blues and I think Oshie is going to be a stud, I am glad this series is over because it means I dont have to watch the Canucks on Versus for another week. They are extremely boring and the Sedine brothers make me physically uncomfortable. Almost as uncomfortable as the McPoyle brothers in It’s Always Sunny InPhiladelphia.